Lots going on with my book and regular life. Wait, that's pretty much the same thing . . . I actually left the house for five whole days to visit beautiful Denver, CO and I didn't write a single sentence. Taking breaks is good for the soul. I'm down to the last few chapters of my 1st draft of my next book, and I can see the light at the end of the tunnel. The first draft is always the hardest part for me. It's tough setting aside the pursuit of perfection and just letting it be crappy. My favorite part is editing -- talk about exercising my control issues! It's like a playground of insanity and I'm in charge of creating some semblance of order. I'll spend the next few months tweaking and cutting and re-working words until my brain hurts. Most writers are masochists. Before launching The City Center into the world, I did months of pain-staking research and the hard work is paying off. 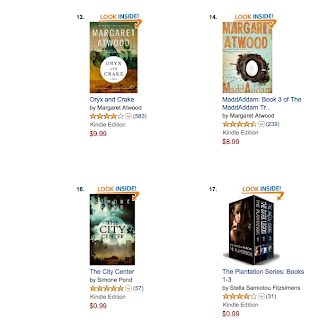 At the beginning of the launch, I told my husband if my book gets listed on the same page as my favorite author, Margaret Atwood, I can die happily. Last night that dream came true! Today my book made Amazon's top ten best sellers in science fiction. I'm still a ways off from the New York Times Best Sellers list, but one can always hope. Besides, I'm happiest when I stay out of the results and remain in a state of hope. 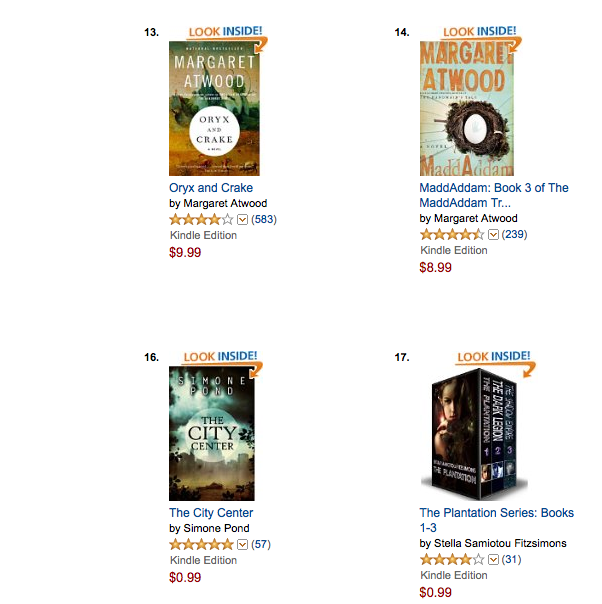 The best part is sharing this journey with my readers -- you guys make writing so much more fun.